This marker pennant bears the faded colours of the 9th Battalion, originally black over pale blue. These same colours were worn in miniature at the sleeve top of the men's uniforms. Although the principal recruiting area for the battalion was around Brisbane a significant number of recruits came from northern NSW. 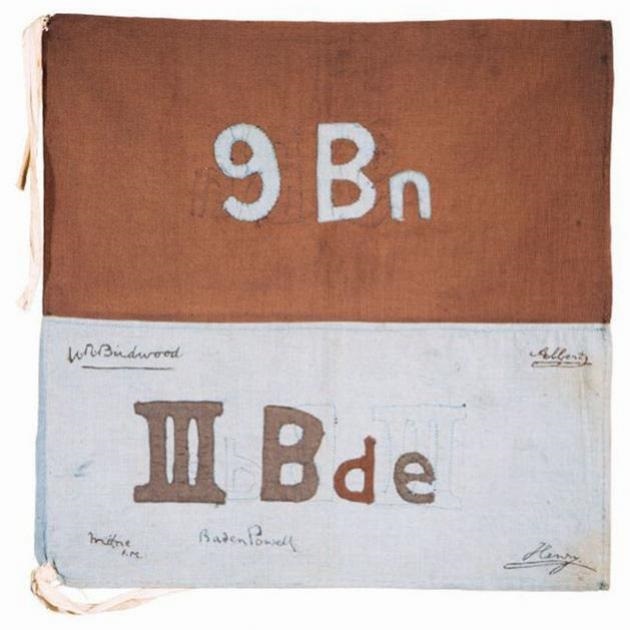 The pennant was used to mark unit lines for the 9th Battalion while training in Egypt and on Lemnos before becoming the first AIF unit ashore at Gallipoli. After its use in the war the pennant was carried to several post-war reunions where it picked up signatures of the Anzac commander General Birwood, the princes and other well known identities.